Two gunmen have been shot and killed in a parking lot outside a venue in Garland, Texas that had been hosting a controversial Mohammed art event dedicated to free speech. As a precaution police and SWAT have swept the area for possible explosive devices. The two suspects drove up to the center and opened fire, injuring a Garland ISD security officer in his leg, the city confirmed. The officer suffered non-life threatening injuries and was soon released from the hospital. Both attackers were killed in the shooting, but police proceeded to search the area for a vehicle that could allegedly have explosives in it. One of the gunmen was identified asElton Simpson from Arizona, previously the target of a terror investigation, ABC news reported citing a senior FBI official.FBI agents and a bomb squad were searching Simpson's Phoenix home overnight. According to tweets from IS followers, the attack was carried out by jihadi militants loyal to the terrorist group. An IS fighter from the UK tweeted - "2 of our brothers just opened fire at the Prophet Muhammad (s.a.w.) art exhibition in texas" and "They Thought They Was Safe In Texas From The Soldiers of The Islamic State," according to SITE Intelligence, an online watchdog of jihadist activities. Reports on the grounds say that police have finished checking the attackers’ car for explosives and announced no immediate threat to area. The FBI has reportedly arrived at the scene to investigate the incident further. People inside the exhibition center were initially ordered to stay indoors, while the nearby Walmart and other businesses were evacuated. The SWAT team evacuated the convention participants to a safer location on a local high school campus. Channel 8 reporter on the scene, Jobin Panicker, reported that initially the crowd heard around 3-4 gunshots. A further exchange of gunfire followed after a brief pause. The Curtis Culwell Center was hosting the first annual Mohammad Art Exhibit and Contest, a controversial “free speech” event that offered a $10,000 prize for the best cartoon of the Prophet Muhammad. The American Freedom Defense Initiative event was being broadcast live on YouTube, when a SWAT member burst in telling the crowd that two suspects had been shot. The event was interrupted and guests and organizers were moved into a secure room by the authorities. The event had created controversy prior to its execution with some seeing it as an attack on Islam. The event’s organizers said they are exercising the right to freedom of speech, according to the Dallas News. The shootings allegedly took place just before 7:00 pm local time, when the event was about to conclude, shortly after the last speaker had finished his presentation. 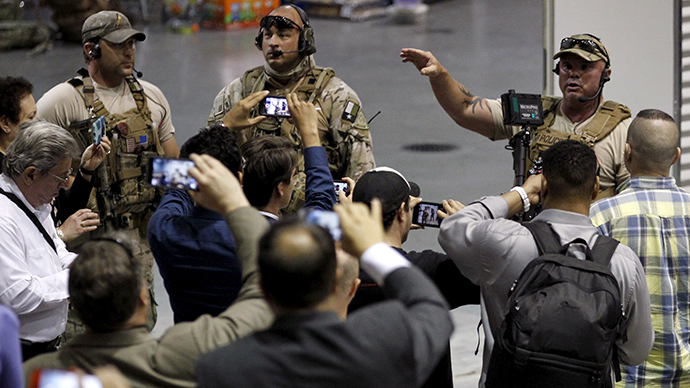 Additional police forces had already been deployed to the Curtis Culwell Center at the time of the incident to provide security because of the controversy of the event. However, no protests were taking place prior to the event, and neither were there threats of any imminent attacks reported. Texas governor, Greag Abbott, meanwhile issued a statement saying that authorities are trying to figure out what caused the “senseless” attack. He expressed his condolences and thanked the policemen for “quickly” resolving the situation. “We were aware of the threats. We were aware of the difficulties. We have paid tens of thousands of dollars for security for this. And you saw the massive security measures that there are in place,” Spencer said about an hour ahead of the incident. One of the organizers, Pamela Geller, was “known to make anti-Muslim statements,” and is notorious for arguing in courts the idea of placing anti-Muslim ads around New York, Al Jazeera reports. The American Freedom Defence Initiative was allowed by a federal court to display its ad campaign on New York’s Metropolitan Transportation Authority buses. Some online comments have suggested that the shooting might be linked to this particular ad campaign. Similar campaigns have also taken place in Washington DC.